JayeL Audio | Winterpills: Pleasantly "Light"
Home » albums, Indie » Winterpills: Pleasantly "Light"
An afternoon nap on a warm day. A relaxing, gradual boat ride down a narrow waterway. Being read to by the perfect story teller. These are all calming ways to unwind after a busy day/week. Using a mixture of acoustic folk/indie rock with subtle fabling, these are the same feelings evoked the Winterpills sophomore album, “The Light Divides”. 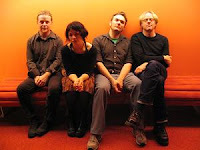 The Winterpills are fronted by guitarist and lead singer Phillip Price along with keyboardist Flora Reed. The duo’s chemistry elevates the quartet’s “The Light Divides” with constant, layered male/female harmonies, which increases the fragile feel of the album. The album begins with the airy, lovestruck “Lay Your Heartbreak” about a person longing to be with another (perhaps without words). Simply, the acoustic fare states “she may never take the cure/she’s been through that/she would rather not be pure/than to be alone.” The Winterpills effectively layer Price and Reed’s vocals on the gem, “Hide Me”. It is the story of a heartbroken person who subconsciously may or may not want to be noticed. With the chorus “hide me/Tell everyone where I am but please hide me/Tell everyone where I am but please hide me/sell everyone the map’s to what’s inside me,” the song is very accessible and relatable. Most of “The Light Divides” tracks (“June Eyes”, “Shameful”, “Folded Cloth”, etc.) all move at a snails pace, but succeed with Price and Reed’s voices intertwined over light guitar strums and delicate percussion. The Winterpills soothe every ache and stress of their listeners like a trained masseuse with melodies that are effortless to listen to but poignant enough to keep your attention.